As Tulsa’s only public four-year university located downtown, OSU-Tulsa offers Oklahoma State University’s world-class academic programs in an urban setting. OSU-Tulsa offers undergraduate and graduate degree programs in areas including business, education, engineering and technology, human services and liberal arts. Undergraduate students generally transfer to OSU-Tulsa after earning their associate degree or completing about 45 hours of freshman and sophomore-level coursework. OSU-Tulsa students graduate with the same OSU degree that students in Stillwater receive. OSU-Tulsa’s downtown location adds to the value of that degree by giving students access to the internship and volunteer opportunities, cultural attractions and social scene that come with an urban campus. Since OSU-Tulsa is a comprehensive research institution, students have the opportunity to participate in research that impacts Tulsa-area businesses, communities and families and changes the lives of those in need. The Helmerich Research Center is a state-of-the-art facility for materials science and engineering research with an emphasis on partnering with industry to commercialize that research. The OSU Center for Family Resilience focuses on research that addresses everyday issues confronted by families and helps transform that research into practice. OSU’s research focus and reputation for high quality pay off — salaries for OSU graduates are higher than those of many regional and online-only institutions. Most on-campus classes are offered one night a week. 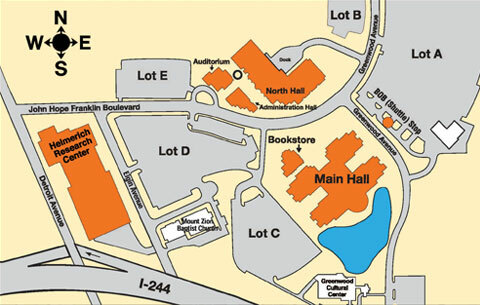 Most on-campus classes start at 4:30 p.m. or later. Online and hybrid class options are also available. Hybrid classes combine the convenience of online classes with some in-class sessions for networking and face-to-face interaction. Earning an OSU degree in Tulsa is affordable, too. OSU was named a 2017 Best Value college by Kiplinger’s — the 14th time it has received this recognition. OSU-Tulsa has awarded nearly $3 million in scholarships since 2005, and awards thousands of dollars in grants and financial aid each year. Since OSU-Tulsa’s undergraduate students are all transfer students, many spend their freshman and sophomore years at local two-year colleges, which typically have lower costs. In a metropolitan setting, OSU-Tulsa advances knowledge, enriches lives, and enhances economic development through innovative instruction, research, and creative activities and outreach. We are committed to the principles of truth and honesty and we will be equitable, ethical, and professional. Treat every individual as you would want to be treated. Be straightforward and forthright in all communications. Respect the confidentiality of private communication. Uphold the highest ethical conduct in the classroom and in research activities. We seek excellence in all our endeavors and are committed to continuous improvement. Encourage others by acknowledging their strengths. Each day do something to improve yourself personally and professionally. Continually seek improvements in organizational processes and services. Cultivate a passion for life-long learning. We believe that serving others is a noble and worthy endeavor. Anticipate the needs of others. Provide prompt and courteous service with a positive attitude. We respect others and value diversity of opinions, freedom of expression, and diverse ethnic and cultural backgrounds. Seek opportunities to learn and understand the culture and background of others. Celebrate and appreciate our differences. Seek to understand before acting. We are dedicated to the efficient and effective use of our resources. We accept the responsibility of the public's trust and are accountable for our actions. Pursue opportunities to deliver services more efficiently and effectively. Empower all to use our resources wisely. Accept individual responsibility for our actions as they affect the institution and those who learn and work here. We believe in ethical and scholarly questioning in an environment that respects the rights of all to freely pursue knowledge.